AIRCRAFT AVAILABILITY The product will initially be available on the A350, but a retrofit programme will see AA’s B787 and B777-200ER fitted with the new product to replace the current forward/backwards herringbone seats. INFO Delays by Zodiac Aerospace in fitting the current “Cirrus” product onto B777-300ER aircraft led AA to cancel its contract with the manufacturer. Instead, B/E Aerospace has been hired to design the new business class product, which will be the company’s popular Super Diamond seat. Not many details have been revealed about the seat, but it will sport the same dark colour scheme as AA’s Cirrus seat on the B777-300ER. AIRCRAFT AVAILABILITY The product will be available solely on the A350. INAUGURAL ROUTE As part of crew familiarisation, the A350 will first be deployed on the Taipei–Hong Kong route from August 1, with regular long-haul service to Amsterdam slated to begin on December 1. 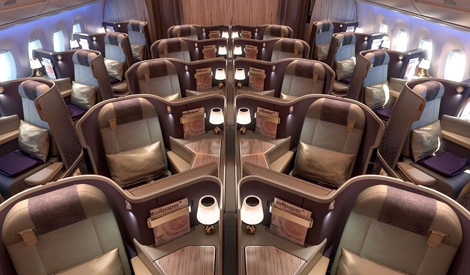 INFO When launched last year, China Airlines’ “Premium Business” seat on the B777-300ER was widely acclaimed for its design. It seems the airline adopted an, “if it ain’t broke, don’t fix it” approach to the new product, as the hardware is very similar with subtle design differences to differentiate it. The A350 business class seat will be the same Super Diamond product found on the B777-300ER. The 1-2-1 layout, 18-inch IFE screen and personal table lamp will also remain, however, the colour of the seat padding is noticeably lighter on the A350, while the carpet will also have a unique design. 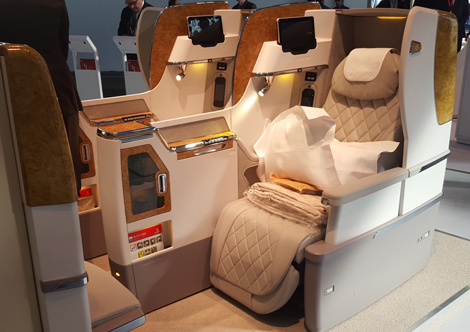 INFO When news emerged earlier this year that Emirates would be introducing a new business class seat for its B777-300ER, many customers were hoping that the airline would implement a comfortable 1-2-1 seating arrangement, as opposed to the tight 2-3-2 layout. Alas, that was not the case when the new seat was showcased at ITB Berlin. 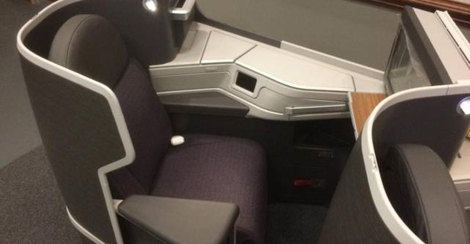 On the plus side, the new fully-flat seat comes with a larger TV screen, expanded personal meal table, improved lighting options and redesigned privacy panels, literature pockets, foot rests and show stowage areas. At any rate, it’s still a significant improvement over the existing product. AIRCRAFT AVAILABILITY Currently available on one A330 but Hawaiian will begin installing the new product on its remaining 22 A330s between September 2016 through to 2017. INAUGURAL ROUTE The aircraft will be rotated to serve a number of routes typically operated by the A330. 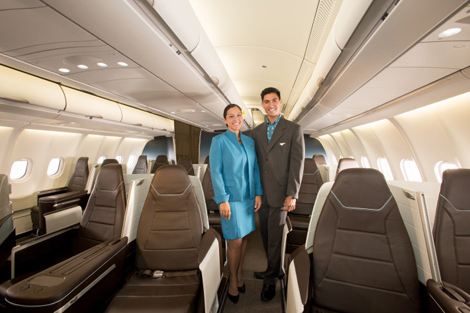 INFO We were excited when Hawaiian Airlines announced last October that it would be partnering with Italian manufacturer Optimares to develop a new business class seat, and boy have they delivered! The 18 fully-flat seats are able to transform into 180-degree beds that feature a width of 20.5-inches and pitch of 76 inches. Also included are two USB ports and an A/C outlet. One gripe is that we would have preferred a 1-2-1 configuration, as the 2-2-2 layout means only travellers seated in the centre seats are afforded direct access to the aisles. INAUGURAL ROUTE The new product is currently available on the airline’s flights from Australia to Los Angeles, with Abu Dhabi to follow soon. INFO The new seat includes a side console area, which provides plenty of workspace, as well as an 18-inch HD in-flight entertainment screen that Virgin bills as the largest on any aircraft flying between Australia and North America. Special bedding is also offered, which consists of triple-layer seat cushions, memory foam mattress toppers and high-grade cotton pillows. 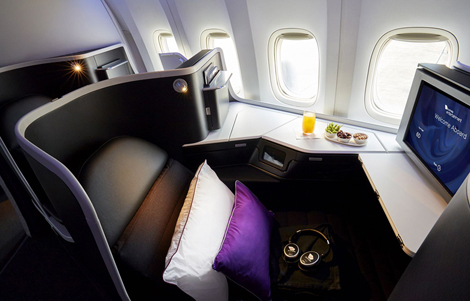 The improvements that Virgin Australia has made to its international business class offering also extends to its soft product in the form of new dining menus designed by Australian chef Luke Mangan as well as a cocktail and canapé service.